I hope everyone’s doing well, and are healthy and happy! I’ve been pretty quiet lately, but it’s not because I’ve lost interest, have been abducted by aliens, or wound up as Scarlett Johansson’s newest boy toy. (Though she apparently does like dalliances with older guys, so I might still have a chance at that.) While I needed some downtime after moving heaven and earth to knock off The Rising Horde books, I’ve also been busy at work on other related projects that I’ll briefly detail here. Sales for The Rising Horde: Volume 1 and The Rising Horde: Volume 2 are moving right along, especially on Amazon. Even better, their release caused some renewed interest in The Gathering Dead and, to a substantially lesser extent, Left with the Dead. I’m very, very happy with the pace of the sales of all the titles, but I see the spillover hasn’t touched any of the non-zombie books. I’m a bit concerned about this, because it makes me wonder if I’m going to wind up as a one-note writer: those guys who can only sell one specific type of property. I have a widely divergent list of interests and skills, and I’d hoped to be able to tap into that for fun and profit in the years ahead. But when I see some pretty rich fare such as City of the Damned and White Tiger essentially withering on the vine, it does make me take pause. This is a business for me, after all, not a hobby. So I need to be mindful of what I can and can’t do. Which leads me to wonder if I should release Tribes, a decidedly non-zombified science fiction adventure novel set in the Antarctic, under the Stephen Knight monicker or if I should consider breaking out with another name. There’s a lot to be said for this approach, and there is some data that indicates folks only buy specific books from specific authors. 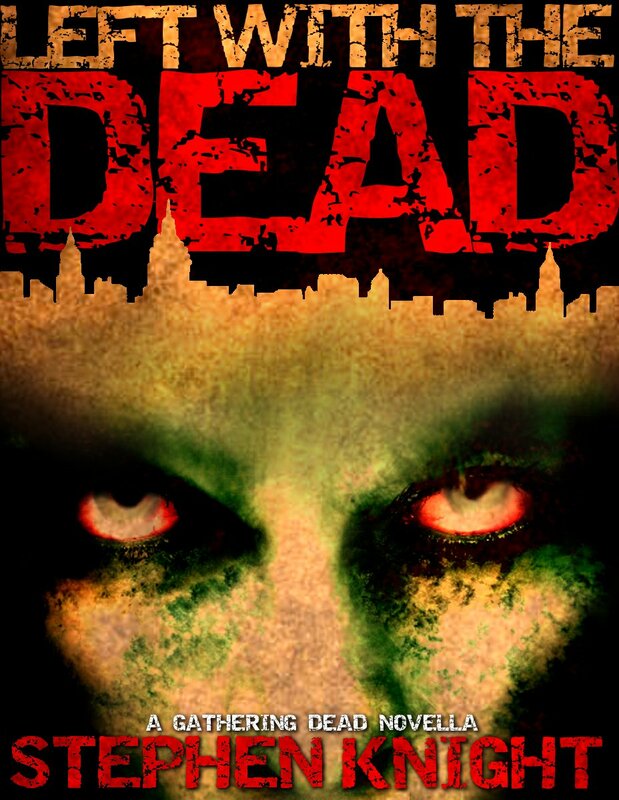 While I like writing about zombies, their retinue is fairly limited, and I’ve already encountered resistance even to my mild attempts to spice up the genre by inserting some feral intelligence into some of the stenches. I get the desire on the part of the reader to want to enjoy similar good experiences, but as a writer, it does leave one feeling a bit boxed in. This is stuff I’ll have to contemplate strongly over the next couple of months as I finish Tribes and send it into the editorial stage. After that, I have several other projects waiting for my tender ministrations. I haven’t decided which one I’ll do next, though I do have a lot of folks clamoring for more Gathering Dead-like fare. Will I, or won’t I? I’m afraid I don’t know myself, just yet. Oh! And if you’ve read any of my stuff, please do leave a review wherever you purchased it. That’s always a thrill! Yeah okay, the Indiegogo crowdfunding stuff is kind of sucking wind. But that’s all right, because at the end of the day, I wasn’t expecting a groundswell of support from that venue. The Gathering Dead is a very specialized product in that it deals with the military response to the zombie apocalypse, then specializes it even further by focusing on Army Special Forces. A lot of folks know about SEAL Team 6 (which hasn’t been called that in years, by the way), but the last time the Green Berets were on anyone’s mind was during the Vietnam War and because John Wayne played one who miraculously took in a glorious sunset where the sun somehow set in the South China Sea. But to that end, look for an Indiegogo Version 2.0 campaign sometime in the summer. By then, I’ll have my multi-thousand dollar trailer locked and loaded, and I’ll be able to better show people what I’m looking to do. And about the trailer? Work is coming along nicely. Very nicely, but it’s not stuff that I can easily show. This is going to have to cook for another couple of months, and to reveal anything that’s not fully formed is going to hurt the initiative more than help it. I haven’t even shared it with my partners yet, because I know seeing partially-formed footage is going to be something of a downer at this point in time. They want something they can use to raise funds, and gray scale polygons and non-rigged animatics ain’t gonna do the trick. So I need to wait, and let the effects team do what they need to do. But interest is a fleeting thing, and balances are all very delicate. So for now, the less I say on that, the better. But things are continuing to progress in this area, albeit in more stealth mode than I would normally like. I’m still following up on converting The Gathering Dead into a 100+ page graphic novel. Since I’m a bit of a control freak, I need to ensure that I fully vet the possible printers out there and understand their requirements fully. The folks who print my current books, Lightning Source, aren’t really adept at this kind of product, so I need to determine just who the final contenders will be and move from there. Overall, it looks like the project will have an out-of-pocket pricetag of around $7,500-$15,000, which is enough to make me take it slowly and ensure that I take the right steps in the right order. Because hey, I really don’t want to have to spend twice as much as I need in order to get this done. And for all three projects, it’s pretty much the same set of circumstances. I’m committed to doing as much by myself, for myself as I possibly can. Why? Because it’s my property, and while I recognize I’m going to need the participation of others–especially for the film!–I’m not going to cede any control unless it’s absolutely necessary. Because at the end of the day, everyone else gets to walk away from these projects with money in hand. I’m the one who has to shoulder the mistakes and failures, while everyone gets to share in the glory. And my aim is ensure there’s more of the latter than the former. Approaching it in any other way is just looney, and I’m sure you guys would agree! Anyway, more to come. Stay tuned, folks. For those who may be curious, LWTD picks up pretty much right where The Gathering Dead left off. 1SG Dave Gartrell is alone in New York City, cut off from the good ship Escanaba. The only way he’s going to survive in the city is if he pulls himself together and resources every ounce of skill he’s accumulated over his thirty year career as a U.S. Army Special Forces Green Beret. But hey, this is Gartrell we’re talking about. Of course he can survive! Our protagonist starts off surrounded by zombies in a giant city, short on ammo, and without any real resources other than what’s on his back. Things don’t really improve for him from there. Instead, they just get tougher. Not only does he have to try to extricate himself, he also becomes responsible for two other people: a mother and her severely autistic seven year-old son. That young boy is what really made Left with the Dead work for me. It takes our über-masculine special forces soldier, and humanizes him in ways most books like this could only dream of. He also makes for some interesting challenges throughout the narrative. Not only must the boy be protected, he must also be kept occupied and calm so as not to draw in the army of zombies prowling the streets. Just a quick thought I wanted to throw out while I recover from the marathon writing session that resulted in The Rising Horde Volume One and The Rising Horde Volume Two (now available on Barnes and Noble’s Nook)–how do folks feel about graphic novels? I’ve been toying with the idea of releasing a comic version of The Gathering Dead, given that The Walking Dead has been such a success. What do you guys think? This would entail me hiring an artist to actually draw the thing, and it would likely be a 100+ pages. Checking out printing costs, a color presentation of something like this would necessitate the end consumer price would be between $24.99-$32.99, which seems a bit excessive to me. Black and white would be quite a bit cheaper, and of course electronic versions would be much, much less. And in this age of iPads, the Kindle Fire, and the Nook Color, maybe that would be the way to go? Like I said, just tossing that out there! Let me know what y’all think.